Queen City Pastry : Welcome! 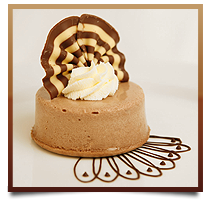 Queen City Pastry has been manufacturing fine pastries and desserts for over 15 years and is based in Mooresville, North Carolina. We specialize in making cakes, cheesecakes, tortes, tarts, and brownies from scratch using the finest ingredients available. We also offer a wide range of individual cakes, bars and buffet items. There is a lot of planning, testing, tasting and love that goes into every one of our desserts, and our wish is that you too would one day make our desserts yours.